No math background... But need help. What is the "?-ft." measurement? The area of a triangle can be calculated as half its base multiplied by its height. If the desired width is x feet, 43*21/2 = 43*8/2 + 21*x/2, so x = 43*13/21. Last edited by skipjack; February 10th, 2019 at 06:59 AM. 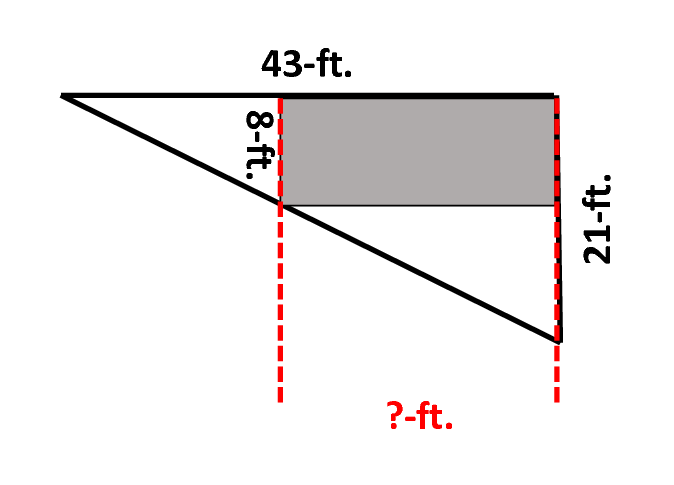 longer-side-of-"gray-box" = 43 - 344/21 = ~26.62 ft. If you want to understand why, google "right triangles"
Last edited by skipjack; February 10th, 2019 at 06:42 AM. I happened to use the word "width" rather than "length", but the value 43*13/21 is correct. As a mixed fraction, it's 26 13/21. 26.62 ft. it is... Thanks! Are you a carpenter building something? Attached: Inside the RED circle is a building/plot-plan. The arrow points to the "triangle" of land. I want to add an 8-ft. second-story deck, and needed to know how long I can build an 8-ft. deck.